So today UCI announced which countries are heading to the Olympics and how many riders they can take. A few where obvious and a few countries that left some people think how? South Africa and Indonesia both claim a spot. So we thought it would be a good idea to come up with a fantasy selection process. Most of these countries picked themselves. USA and Holland could take more than 3 riders but I’ve gone with the those three. France I was torn between Andre and Rencurel but went with Andre despite Rencurel’s performance at the World Champs. Andre has made a few semi-finals this year at the World Cups so I feel he has more experience. But I’ll probably be proved wrong. With Switzerland blanc could have been in the mix but you can’t look past Graf after his performance at the worlds last year and some this year. Venezuela I went with Milano, he’s young (a lot younger than Suarez, who is 34 this year). It will be a good experience for the youngster. South Africa will take Dodd, I was hoping Sifiso was on the scene as he was the only rider I knew from SA. And finally the one who will annoy a few people is the Indonesian rider Syarifudin who qualified because of some relocation rule. The guy raced in Colombia getting 6th, 6th, 6th in his motos (Out of 6 by the way). Just to add insult to injury he was also 10 seconds behind the guy in 5th. Thats got to annoy some fast riders out there. Not too many surprises in my picks, although picking the 3rd French rider I believe should be on the plane was très difficile. Fan favourite Silvain Andre took a harsh digger out the front door in the TT in Colombia keeping him out the race whilst Jeremy Rencurel took it all the way to the big show landing a 4th…so it would be a kick in the balls to not be on the plane after just turning out such a good performance at the Worlds. Rencurel’s vastly improved form has been the subject of many a Whatsapp group chat in the past two weeks…but that’s none of my business. Renaud Blanc should be there instead of Graf, because of recent performances i.e 3rd at Manchester World Cup and making the semis at Worlds…and the fact he’s not a bellend. Matty Cameron booked his place in my eyes for NZ after a stormer at the Worlds, doing it for the old boys! The arse has fell out of the German squad in recent times, meaning that Julian Schmidt should be on his way. Brethauer was DQ’d apparently at the worlds meaning Schmidt was the only German to reach the 1/4s. Many of the countries that have qualified one rider are sending utter garbage, christ knows why we need motofill at the O show ! USA – 3 riders – For me this one’s easy, Long has already qualified his place, the other 2 should be Sharrah and Fields with no need for a trials race. No other American has made a world cup main for the last 2 years apart from these 3. If Connor’s injury isn’t fully right in time (not likely) I’d stick Upsheezy in there. Netherlands – 3 riders – Kimmann and Van Gendt are the obvious top 2, it’s between Van Gorkom and Van Der Biezen for the last spot. Both coming back from injuries at the moment, I’d lean towards Biezen as he came from a string of bad results at the beginning of 2012 to being on fire in London winning the time trial and narrowly missing a medal. Maybe he could have done it again. 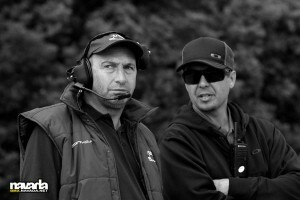 Australia – 3 riders – Willoughby, Dean, Turner. Juster is finding a bit of form but not enough to break into the team I don’t think, I’d put him as the reserve. It’s a shame Max Cairns has had some bad injuries over the last few years because I think he could have been up there. France – 3 riders – Daudet and Mir are the standouts. Leaving Rencurel and Andre. Rencurel’s been storming the last few races and Andre was winning the worlds TT before his digger. I can’t choose. France should have 4 places. Great Britain – 2 riders – Liam, obviously. I personally think Kyle and Tre should have a trial race/dance off/rap battle/fifa match to decide who gets the 2nd spot. You can’t say who would have a better chance of doing better! Latvia – 2 riders – The Machine is my pick for the win, he’ll be focused. Treimanis has to get the other slot after his 5th at the Worlds. Krigers has been looking alright recently and thought he might be able to sneak in there, but no decent worlds result for him. Colombia – 2 riders – 2012 bronze medalist Oquendo and Ramirez are both main makers and could put themselves right up there. No one else to consider really. Jiminez has had a good run over the last decade but don’t think he’ll make a third games. Argentina – 1 rider – they have Marino, Villegas, Torres and Molina. 4 riders who are good enough to be there but I’d send Torres. I can just see him wreaking havoc round that Rio track. Switzerland – 1 rider – If I was going with my head I’d say Graf, I can see him doing better at Rio than Blanc would but Blanc is so sick it would be awesome to see him get in the final. They both should be there. Canada – 1 rider – Nyhaug is the no brainer. He is podium material of he has room to thread his way through, which he will have. New Zealand – Trent Jones has had the most consistent results recently but Matt Cameron’s worlds performance was rad! It would be good to see a 30+er doing well at the Olympics. Jones missed the worlds with an injury so it’s another tough one where they both should get a pop. Brazil – 1 rider – Rezende in his home country could be a huge spoiler. He can really ride his bike and with the crowd behind him I think he could sneak into the main. Japan – 1 rider – gotta be Nagasako, he hasn’t been setting the world alight recently but it could be a different story on a track like Rio which suits him down to the ground. Ecuador – Campo has one of the best first straights in the game when he’s on it. If he puts himself at the front he’ll have a good opportunity. Emilio Falla is the other option but with no telling results recently it has to be Campo. Russia – 1 rider – the battle of the Evgeny’s will be won by Komarov I think! He has a nippy first straight. He just needs to hold onto it. Germany – 1 rider – has the national team fallen apart over the last year? They used to be a 5 or 6 man team I’m sure, but I think it’s just between Brethauer and Schmidt now. Brethauer would be my pick, don’t really know why. Norway – 1 rider – Navrestad had his first ever SX main at Manchester this year. Pretty sure he’s the only world class Norseman these days too. Not olympic medal material in my book but good luck to him. Venezuela – 1 rider – Who the hell is Jefferson Milano? No idea but he’s fast! First saw this guy taking names at Papendal and he backed it up with a good Worlds showing. South Africa – 1 rider – I think it was Kyle Dodd who qualified SA’s spot. By rights he should be going, fair play! Denmark – 1 rider – a few to choose from – Laustsen, Therkelsen, Andreasen, Christensen.. Chris looked like he was coming into some form but didn’t get selected to race the Worlds. He would probably have been my pick. Leaves Laustsen as the logical pick. Indonesia – 1 rider – literally no idea. Not sure how they got the wildcard spot when Italy could have sent someone like Riccardi who could do alright! I feel like the explanation as to why I’ve chosen these people is “i couldn’t decide so I went with who was a bae” which appears to follow suit for around 15/32 hahaha. Fields was the obvious first choice for USA even though he’s been out with injury, I’m sure he can pull something out the bag come the big day. Corben Sharrah has always been a personal fave and I feel he’s got more to give. Nic Long has always been around but recently seems to be making gains and his podium at the worlds reflected that. Niek is just unreal like his achievements in the past few years deserve an Olympic medal alone. Dave v.d.Burg is also a big horse with plenty to give and deserves a spot. And Twan I think should also have a spot. Sam was the obvious choice for my first spot for Australia being a silver medalist and all. Anthony Dean the big dog because he’s just come back from injury and making semis at the worlds, possibly would have made the final if he didn’t unclip. Bodi I think is the other most consistent Aussie. Even if Rencurel didn’t get W4 in Colombia, I probably still would have said him because he’s hot and still pretty quick hahaha. Joris, obviously a fast one and is going into the Olympics as W1. My last spot was between Amidou Mir and Romain Maheiu but seen as Maheiu has been injured, I’ll choose Amidou based off his consistency, his sick dance moves and the fact he doesn’t take himself too serious. It’s obvious that prince Phillips will get the first spot. So for the second spot, I’m going to play safe and write Curtis Manaton because he’s got a few ponies and if I write either Tre or Kyle – either one of them will kick off hahaha. I’m really hoping Maris can do the threepeat. Just purely for the fact I find it hilarious that he’s sitting there with two golds that everyone’s chasing and no one else has got a look in. Rihards Veide takes my second spot for Latvia because he’s always there or there abouts, took a couple of euro wins and is an all round good guy. A lot of love for the Veide. Carlos Ramirez and Carlos Oquendo I think have been the most consistent Colombians across the board. Molina gets my spot for Argentina cos he’s a quick kid and also rides for Stay Strong. Although I agree that David Graf and Renaud Blanc should both be there. I’m gonna have to choose Graf for his podium in Papendal and he always manages to work his way through the pack, he’s got good race craft and seems like a decent guy – what other pro live streams the worlds from their hotel with their phone standing in a shoe? Tory Nyhaug for Canada…cause he’s a bae? I’m really hoping Trent Jones gets chosen because I made a bet with my dad last year after one of the World Cups that he’s gonna be a dark horse come the Olympics. So I’ll take Trent. Rogerio Reis for me, another SS rider and I haven’t really seen much of Rezende recently. Yoshi Nagasako when he has a clean lap can put in a good one, I think he could be one of those that upset a few people. No brainer, Alfredo Campo. Real good rider but recently hasn’t the results that reflect that. Emilio Falla is the only other rider I know from there but I think I rate Campo more. Germany used to have a massive squad and now you only really hear of Julian Schmidt, so I’ll take Schmidt as he was the only German to make quarter finals in Colombia. Sehr gut. Tore Navrestadt because he made his first World Cup main in Manchester and can be rapid when he puts a decent lap in. Jefferson Milano because I had to undertake a bit of research when Papendal was on to find out who this quick kid was when his name was appearing at the bottom of the screen. But up until then, I didn’t know a male rider from Venezuela. Going to have to go with Kyle Dodd as I was about to write Sifiso Nhlapo then remembered he doesn’t race anymore. I think Chris Christensens time is coming and he’s been making a lot of gains the last couple of years. I think although Laustsen is wiser and has been around a lot longer than Chris, there are no stand out results for me (that I can remember) that determines who is better and deserves the spot. As for Indonesia, I can’t actually name a rider. I think the relocation rule was slightly stupid and should have gone to a more deserving country like Italy and should have sent someone like Riccardi, Furlan or Cristofoli who can all do decent – and they can put in a better lap. The first national is just one week away. Here is the weekends schedule so you know exactly what is going on for the start of the 2016 race season. 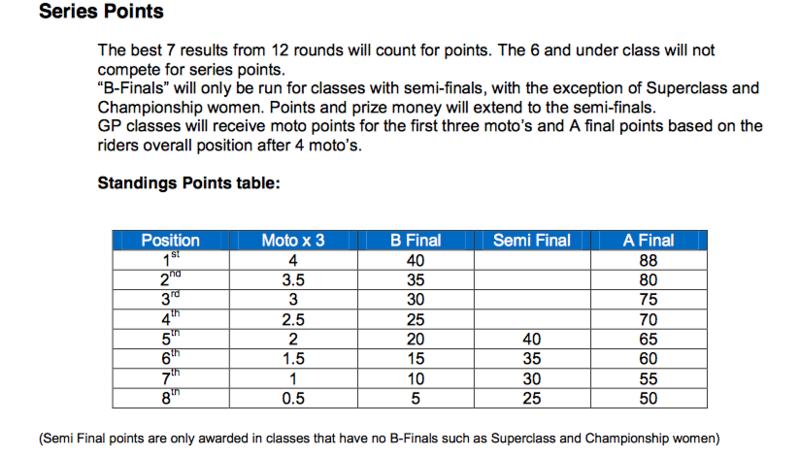 Another thing to notice ahead of the new season is that the point system has been changed back to the old system. There is now more emphasis on where you finish in the final, which is how it should be in our opinion. Here is the breakdown of the points. 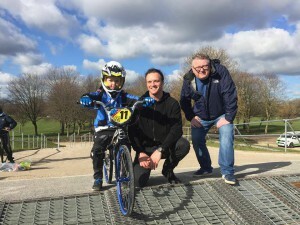 As some of you would have seen, Kelvin Batey met a youngster called Callum at the Alvaston, Derby BMX track just casually riding around on a school day. He was on a make shift bike but Kelvin saw some potential in the little man and what happened next just may change this youths life. Callum has a big goal. His goal is to reach the Olympics and Kelvin thought he may be able to help him. So step up the BMX community. Kelvin put a post on social media and christ did the BMX community step up. There was huge support for Callum and by the end of it Callum had a better deal than some of the Pros on the circuit. 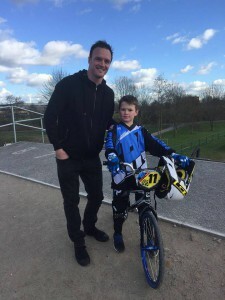 Anyway today was the day that Kelvin delivered the BMX goodies to Callum at Derby where it all began just 3 weeks ago. Three weeks after meeting Callum we were able to meet up with him earlier and give him a load of stuff that was donated by the whole UK BMX Community. When I first met him I could see his enthusiasm for BMX and set out to try and get him a few things to help him progress and reach some goals he spoke about. After the original post a few weeks back we have been overwhelmed with the amount of offers for donations and help so it came to a point where we could totally have kitted him out 5 or 6 times but the stuff that has come through from everyone has been absoloutely amazing. Callum is now decked out with a new complete race bike, helmet, custom race kit, goggles, number plate and custom stickers. There have also been offers to take him to regional races and purchasing his race licence….unreal! For those that were saying Callum should have been at school on my last post he has had a few problems so only does half days. He spent all his free time on his old bike but he is now saying he wants to get back into full time education after the boost of receiving his new stuff. Further down the line I’m looking to set up some kind of foundation in each region to do something similar for riders showing commitment to the sport and wanting to do well and this will be put together at some point at the end of this year. Again, thankyou to anyone that has, or even offered to donate for Callum. He did say to say thankyou to everybody himself and he loves all his new stuff. I’m sure we will see him at some races this year especially with the British Championships being at held at Derby in August. 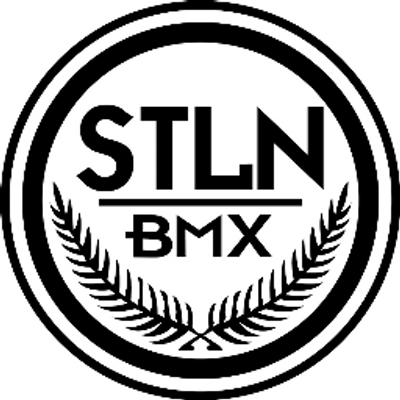 So proud to be part of this amazing BMX Community. Well done to all those involved!! 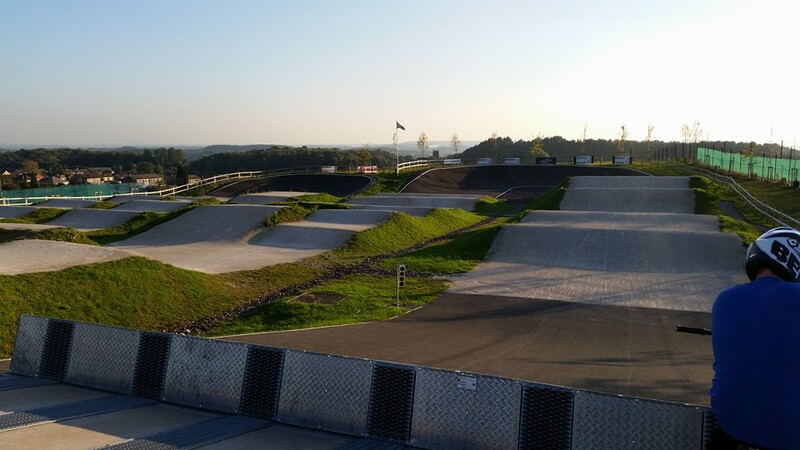 If you didn’t know that Leicester has a new BMX track then where have you been. This was MaxTrax first full build and it’s a track that suits all riders. After hosting the Midland Champs in September 2015 their 2016 plan is to grow as a club. In 2016 they are hosting a Midlands Regional on Sunday 5th June but also looking to start a Wednesday night race series once the clocks go back in March looking to start late April. If you can’t wait until then, Saturday sessions are on every week 10.30am-12.30. 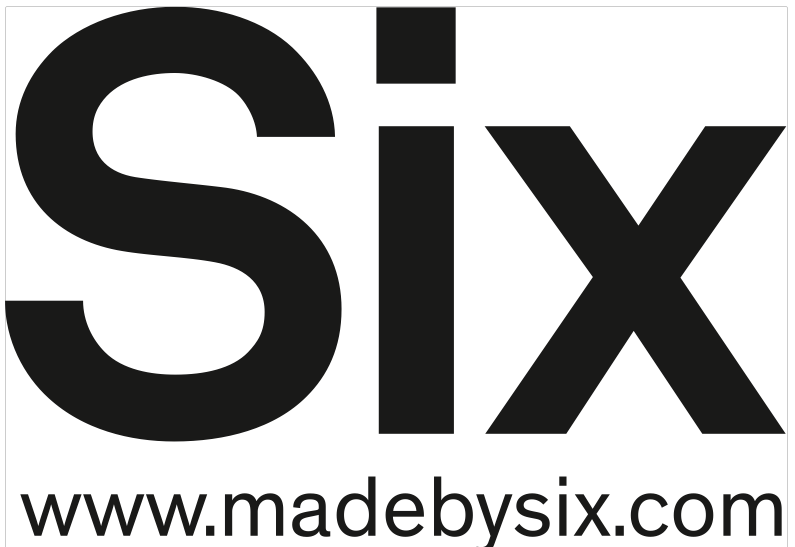 Check out their promotional video. For those who have been in the game for a while will know who this man is. Some who haven’t been in the game too long will also know him and those who have been on the wrong side of him will definitely know him. He is one of the funniest guys in BMX for sure, I had the joy of meeting him at the age of 6 when he along with the family took me and the old man to Rene Indoor race in France. It was this trip we also found out that my old man (Terry Issitt) realised that you have to have a passport to go to France (who would have thought it). Well 21 years later I still have a lot of time for the guy, thats Euan and my old man for that matter. So BMXHype.com caught up with the busy man before he jets off around the world ahead of a busy BMX calendar. One for the people who don’t know. Who are you and what do you do? 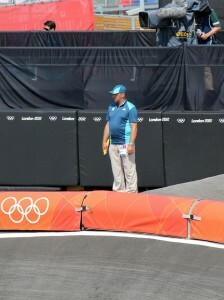 My name is Euan Goodman I am an international commissaire working for the UCI. As the main man, you must be in demand for many races. Where is 2016 taking you? I fly to Geneva tomorrow for a UCI meeting to discuss the World Championships, SuperX and the Olympics. In March I fly to Argentina for the 1st SuperX race, 2 days after that I’m at the Pan American Continental Champs. Then onto Manchester for round 2 in April, Papendal for round 3 in May. Then Columbia at end of May for World Champs and then Brazil in August for the Olympics. I do let her know where I’m going but don’t discuss it lol. What is your most memorable decision you’ve made? 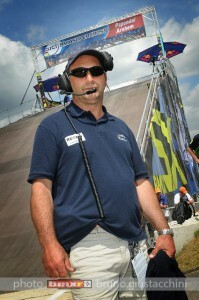 I think it was the 1 in France at the Euro Champs, Keith Bryceland was on the gate in the final of the cruisers. As the starters call started someone made a noise at back of the start hill. Keith went over the gate and everyone else rode off down the track. I was about to stop the race when they all fell off in the 1st corner. Keith rode past them all and was a straight clear of the next rider. I thought that’s fair he back in the race lets carry on. What I didn’t know was that Keith would ride down the last straight still a whole straight in front and fall off. He then got back on his bike only to find out that he had snapped his forks and didn’t bother to finish. I couldn’t stop laughing but at the same time I felt for him. How do you deal with those who don’t necessarily agree with your decision? Its the same for all, I try to explain why the decision was made they don’t normally agree but that’s racing. I have to back the commissaires working with me otherwise we might as well go home. I’ve heard you are the main man for the O Show? Yes I have been appointed to the event, it’s a honour to be part of the event. A special thank you to Carol Gosling who got me started as a commissaire. A lot of drama around the test event, can you talk about it? Or did you fancy a second trip out to Brazil before the Olympics? 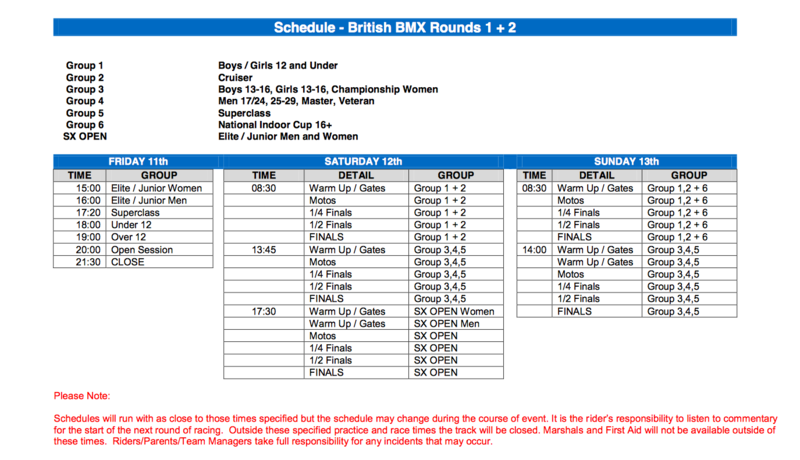 We had a few problems but that is why we run test events so that the main event shows how great BMX is. No, we have a great team set up and who would not want to be out in the middle of the track watching the finals of the best cycling discipline there is. How do fit all this in working 2days a week? Its not easy but I try and start late and finish early so I’m not over tired. Who’s going to succeed you when you throw in the towel? I hope Ria will get right into it, she knows the sport well and would make a great International commissaire. What do you think to Robbie Goodmans comeback? Well… lets just see how many cross winds there are at races to put him off lol. Tell the people about the story at Bournemouth when the beer was off? Well Mutly (RIP) and me were drinking in the rugby club at Bournemouth track and he said that the drink was not right, but we kept drinking it anyway. Well, we left the club he was ill, I was sick, passed out outside my campervan. I woke up naked, sick everywhere so moved along the mat so was not lying in it then passed out again. Woke up at about 7am dragged myself inside camper and went back to sleep. Woke back up at 11am thought I’ll go over to the track lasted there 10 mins then went back to camper and slept till 4pm. So the beer was deff off. Well… I don’t like them, this is a national series, finals are 1-8 thats it. B finals are for regional racing. How did you feel when your favourite daughter gained that W1 plate (three times) ? She deserved it she has stuck at BMX for so many years and is a credit to the BMX family. She always has time for anyone. So to be multi World Champ is no more that she deserves. Why do you think your starting technique never really kicked on? I don’t know it used to catapult me down the track, I think the main reason was clips not so easy to get your other foot in lol. Well there you have it people. An insight from a man who has been in the game for a very long time. A genuine down to earth guy who doesn’t take himself too serious. If you never got a chance to see the famous starting technique it was a work of art. Just remember if you see this face, you’ve probably done something wrong. Just take it, accept it and remember you are more than likely wrong. Racing is racing and leave it on the track. The officials do a great job and without them we wouldn’t have a race series… even if Euan didn’t see it, he’s still right. The 2016 National race dates have now been released by British Cycling. This year consists of 12 rounds, 6 double header weekends of racing. 4 of the venues are well established national tracks but two are new to the national scene. Rounds 1 and 2 as has been for a few years now will begin in March at the National Cycling Centre in Manchester. The Indoor is now a mixed bag, some still love it and some are over it. Which ever side of the fence you sit you can at least agree that the UK’s unpredictable weather will not spoil this one. The opening weekend of the season is where everyone gets to show off their new kit, bikes and who has out the effort in over the winter months. Rounds 3 & 4 we head to one of the best tracks in the UK (in my opinion), Birmingham. This Midlands track usually throws out some great racing and come late April I expect the same will happen this year. Under new management what will they have in store for us. In May we head north, way north to Scotland for rounds 5 & 6. It’s on this journey north where I appreciate how much travelling they all do to get to all nationals (Well done guys). A new track last year on the circuit and they put on a great show, even kicking the national off with bagpipes. The racing was fast and I’m sure the Scots will step it up even more this year. Can’t wait for this one. The second half of the season heads into the Capital for rounds 7 & 8. Peckham again held their first national last year and threw up some amazing racing. This track has corners which you are guaranteed to see a move happens every race. This national was a contender for national of the year in racing terms. Hopefully they tweak viewing issues which a lot of spectators stated last year but in terms of racing, you know this is going to be a great national. The last two weekends of the season is when we get to see the newbies. First we head to the seaside, Blackpool hosts rounds 9 & 10 on a track that has been there for some time. They have finally given into demands and applied for a national. Watch the video taken from a Tuesday club session from back in 2014 and get your homework done. The closing rounds of the season are in Telford in the Midlands. Telford have hosted regionals and the Midland Champs in 2014 but this will be their biggest event to date. The C&K built track has a pro section and flows well as most C&K tracks do. Bensink gate and four straight that fall away this should make for some interesting racing. 2016 National Series see two more rounds this year, two new venues and a lot of new national champs. See you in March at the Indoor. Until then, get training (But have fun with it). British Cycling GB have a new kit. Although this video shows the track cycling version the BMX version will not be too different. The kit marks 10 years with Adidas. Only one year to go until Rio 2016. Here are your moto sheets. Click the link, find your age and see your sheets. Don’t worry who’s in there as to be the best you have to beat everyone. Elsa Rendal-Todd – W1 CHAMP!!! Taylor Hunt – W1 CHAMP!! Betsy Bax – W1 CHAMP!! Ryan Martin – W1 CHAMP!! Ross Cullen – W1 CHAMP!! When it comes to the BMX World Champs the first thing I think about is racing! Shortly after that I think Schweepstake. This year at Zolder is no different! The first worlds Schweepstake was in South Africa 2010 on the Zelltours trip. All tickets sold on the coach before we even arrived at the venue! People were throwing rands around like it was Monopoly money. Euros are the same. So in Zolder make sure you find Shaun Issitt and get involved in the Schweepstake. This year for the first time ever top 4 places will be paid out. This documentary by Corinne Walder will show what it’s like for current World Champ Sam Willoughby & girlfriend Alice Post throughout 12 months of BMX and on going in their personal life. This looks to be a real good watch! This will be available soon on iTunes! Which National are you looking forward to most? Which 2018 National you looking forward to the most?